Published January 6, 2014 By Anna T. This post may contain affiliate links. Regardless, I only recommend sites I've researched and/or used and trust. 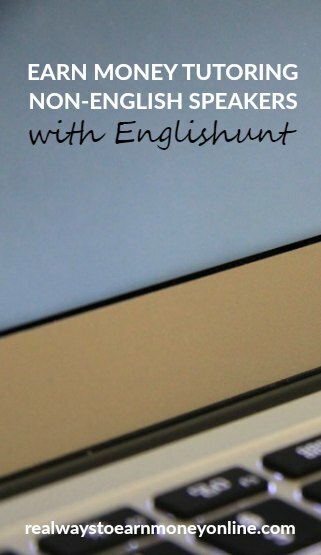 Englishunt is a company you can apply with to get paid to teach English online. The company was founded in Korea in the year 2000, so it has been around for quite a number of years now. Englishunt claims to be the largest provider of live video classes for English language instruction in South Korea. This is a company where you CAN get a job even without prior experience in the ESL field. The opportunity is available to people in the US only, and it's an independent contractor position. As you probably have gathered by now, the work simply involves tutoring South Korean students of all ages in English. This can be done via either video or phone. Some of your students would be adults and some may be school age. You do not need to speak Korean in order to get the job. The classes are anywhere from 10 to 20 minutes long. Their website states that each class will have a minimum of two students or more. The rate of pay is not listed, but the website says it's awarded on a “case by case” basis. Also, some people are paid hourly while others are paid per session. From what I'm reading, some applicants also get the opportunity to be paid to write for Englishunt (ESL/EFL content). Englishunt pays once per month via check. You have to invoice them monthly to get paid, and they mail out checks on the 25th after they receive your invoice. Your schedule will depend some on your availability and they do prefer if you work in two hour blocks of time. Most classes do not last more than 20 minutes. According to the Englishunt FAQ, typical peak times for the instructors are 4 am – 11 am EST and 4 pm – 8 pm EST as well as 11:00 pm to 4:00 am. You must be at least 18 years old, and if you are applying to tutor via video, you must have either a teaching or substitute teaching certificate. You do not need any type of teaching certificate if you're going to tutor via phone. As far as tech requirements are concerned, you need high speed internet, a headset, and preferably a non-Mac computer. You will also need to have Microsoft Excel so you can send Englishunt your invoices and you'll need to know how to use Microsoft PowerPoint for doing the lessons. Englishunt will do some tech testing with you to ensure your equipment is up to par. If you make it to the training phase, it will take anywhere from an hour to an hour and a half to complete. They say that not everyone makes it through training, but if you do, you can usually start working after the training process. It does not appear that training is paid. After you fill out the online form, you'll be called for an interview and tech tests will be done at that time on your equipment. There is a second phone interview after that where you'll have to do a mock lesson. I have worked with Englishunt since 2008 and I love it. The students are amazing and so studious. I get 15 teaching hours a week in my main program and I sometimes pick up hours in the night program, but that is more difficult because it is third shift for me. I love working for this company! They are very nice, understanding, helpful, and flexible. The managers/supervisors are always willing to help! The Korean teachers and students are a joy to work with! I have been with Englishunt for only a few months, but I have enjoyed every minute of it. You work with students who are motivated to succeed and have a great sense of humor. The work load is fairly light, with the only expecation: show up and make the learning experience of the students as fun and enjoyable as possible! The supervisors are amazing and are willing to help at every turn and give great feedback for how you are doing. Even though the classes are taught online or over the phone, you really get to bond with the students and grow teacher-student relationships like you would if you were in a regular classroom. If you enjoy one-on-one, small group, or full classroom discussions, then Englishunt would be a great fit for you! You can see lots more reviews at Indeed here. Overall, I'm not finding much in the way of negative feedback. Go here to get started on your application. I can't confirm whether or not Englishunt is actively looking for tutors at this time, but if it interests you, it doesn't hurt to have your application in. If you're looking for more companies hiring remote ESL tutors, you can always check FlexJobs. They are one of the biggest job search sites on the web that focuses on home-based jobs, and they have positions listed daily across a variety of categories. Because they don't run advertisements on their site, they do charge a small monthly fee to access. But, you can cancel at any time if you don't the information helpful.